"SYY" redirects here. SYY may also refer to the IATA airport code for Stornoway Airport. This article is about the American food-service company. For the Canadian Crown corporation, see Sydney Steel Corporation. Not to be confused with Cisco or Sisqó. Sysco Corporation (an acronym for Systems and Services Company) is an American multinational corporation involved in marketing and distributing food products to restaurants, healthcare and educational facilities, hospitality businesses like hotels and inns, and wholesale to other companies that provide foodservice (like Aramark and Sodexo). The company is headquartered in the Energy Corridor district of Houston, Texas. Sysco, an acronym for Systems and Services Company, is the world's largest broadline food distributor; it has more than 600,000 clients in a wide array of fields. Management consulting is also an integral part of their services. The company operates approximately 330 distribution facilities worldwide; providing service to over 90 countries. The company was founded by Herbert Irving, John F. Baugh and Harry Rosenthal in 1969. The company became public on March 3, 1970. On July 20, 2009, Fortune magazine ranked Sysco No. 204 in the annual Fortune 500 companies in world based on sales volume. On May 3, 2010, Fortune ranked Sysco as the 7th largest Fortune 500 Company in Texas and 55th largest in the U.S. by total revenue. Sysco is also the largest non-oil related company in Houston and the third largest non-tech related company in Texas (behind AT&T and Dell). The company ranked No. 54 in the 2018 Fortune 500 list of the largest United States corporations by total revenue. In December 2013, Sysco announced an $8.2 billion planned acquisition of its next-largest food distribution rival, US Foods. The Federal Trade Commission challenged the acquisition as a violation of the Clayton Antitrust Act that would substantially lessen competition. The court ruled that the combined company would likely reduce competition because it would control 75% of the U.S. food service industry, Sysco terminated its merger with US Foods. As of 2018, its current ceo is Tom Bené. In 1981, SYSCO Food Services bought out the assets of Lankford Produce, based in West Pocomoke, Maryland and founded in 1964 by Stanley E. Lankford, Jr., forming the Lankford-SYSCO division in the Delmarva Peninsula, renamed Sysco Eastern Maryland in 2008. In 1988, Sysco acquired CFS Continental which had recently been acquired from Tate & Lyle through their purchase of A. E. Staley in Illinois. In 1996 Sysco was the third largest company in Houston. It had over 30,000 employees. In 2002, Sysco purchased SERCA Foodservices and renamed it Sysco Canada. SERCA had been owned by the supermarket giant Oshawa Group, who were acquired by Sobeys in 1998. In 2003, Sysco purchased Asian Foods, the largest Asian foods distribution in North America. The first group of Asian Foods joined Sysco Kansas City in 2006, followed by Asian Foods Chicago joining Sysco Chicago in Sep, 2009. In 2009 Sysco acquired Pallas Foods, the largest food distributor in Ireland. Continuing the expansion of their Irish offerings, in 2012 Sysco purchased Crossgar Foodservice for an undisclosed amount. On December 9, 2013, Sysco announced they would acquire US Foods for a total of $3.5 billion. But in June 24, 2015, US Federal Judge Amit Mehta ruled that the combined Sysco-US Foods would control 75% of the U.S. food service industry and would stifle competition. On June 29, 2015, Sysco terminated its merger with US Foods. The SYGMA Network, Inc. is a wholly owned subsidiary of Sysco that provides food and non-food products to chain restaurants throughout the United States. SYGMA was founded in January 1984 when senior officers of Sysco Corporation started discussions for forming a new distribution company. The first products were shipped in May 1985 from SYGMA’s first distribution center in Oklahoma. In 1988, Sysco acquired CFS, increasing head count at the organization. SYGMA's customers include approximately 16,000 restaurants representing 27 concepts. Operating from 15 distribution centers, SYGMA is one of the largest chain distributors in the United States with sales over $6.7 billion. 191 million cases of product are delivered each year. SYGMA currently employs over 4,000 employees. Beginning in the Summer of 2013, the California Department of Public Health was investigating a total of 21 sheds which were never regulated and never inspected. This food included overnight drop-offs of chicken, pork, beef, bacon, and milk. An investigative report by KNTV recorded food sitting in these sheds for up to five hours, in temperatures as hot as 81 degrees Fahrenheit, before the food was delivered to hotels and restaurants. An employee speaking anonymously stated that sheds in Spokane, Washington, had refrigerators which were not large enough, and that most of the time there were cases of frozen food sitting on the floor outside the refrigerators. On July 16, 2014, Sysco agreed to pay fines totaling $19.4 million in California and admitted to the allegations made by KNTV's news team and investigated by the California Department of Public Health. ^ a b c d e f "Sysco Corporation 2017 Annual Report (Form 10-K)". sec.gov. U.S. Securities and Exchange Commission. February 2018. Retrieved 3 April 2018. ^ "Land Use and Demographics." Energy Corridor District. March 2009. 3 (7/53). Retrieved on January 16, 2010. ^ a b "Fortune 500 2010: States: Texas Companies". CNN. ^ Some independents eager to take bite out of Sysco, The Deal Pipeline, William McConnell, April 3, 2014. ^ Gara, Antoine (June 29, 2015). "Sysco Cancels $8.2 Billion US Foods Takeover In Big Antitrust Win For FTC". Forbes. Retrieved October 1, 2015. ^ Hassel, Greg. "Sysco goes to court vs. RioStar/Chapter 7 sought for Ninfa's parent." Houston Chronicle. Friday October 18, 1996. Business 1. Retrieved on February 6, 2012. ^ Jones, Kristin. "Sysco Buys Crossgar Foodservice, Pushing Irish Expansion". Wall Street Journal. Archived from the original on June 17, 2012. Retrieved 15 June 2012. ^ "Sysco Cancels $8.2 Billion US Foods Takeover In Big Antitrust Win For FTC". Forbes. June 29, 2015. ^ "Sysco Terminates Merger Agreement with US Foods". June 29, 2015. ^ a b UPDATED: Unrefrigerated storage prompts Sysco investigation, The Packer, Mike Hornick, July 15, 2013. ^ Sysco Food Corp. Employees Claim Food Sheds Commonly Used Throughout U.S. and Canada, KNTV, Vicky Nguyen, Kevin Nious and Jeremy Carroll, Sept. 18, 2013. " ... Employees from coast to coast say that all of these sheds were hidden from health officials and never inspected." 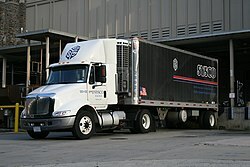 Wikimedia Commons has media related to Sysco. This page was last edited on 27 March 2019, at 15:07 (UTC).